DANCE WORSHIP - Praise and worship through creative christian dance videos dvds. Ray's best work yet." P. Robertson, Worship Ministries Int. This DVD combines the action of live creative art combined with the enhancement of music and dance. O4eyes2C makes the perfect gift to give to someone who is a dancer or anyone who has an interest in art, music, dance or in the christian performing arts arena in general. •	a great gift for unsaved friends or family. Dancing is a creative artistic worship expression that stirs the heart and draws us deeper into His presence. The Bible holds numerous accounts of people dancing before the Lord. People like David and Miriam expressed themselves through dance and encouraged others to worship the Lord through movement. 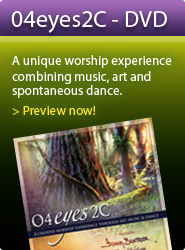 Let dance take you to a new dimension of worship as you experience His presence through dance. Dance is an expression of the creative heart of God; an expression of who He is. God has created us in His image with the ability to be creative. Not allowing ourselves the ability to embrace creativity stifles what God has placed within us. Church should be the most creative place on earth because we are coming together to celebrate and worship the Creator. Praise and worship dance encourages creativity and expressing ourselves to the Lord in worship. However, some people within the church believe dance is unnecessary and too extravagant for church. This is a similar stance to what those around the woman pouring oil on the feet of Jesus thought too. Yet to Jesus it was a sweet fragrance. Dance is an extravagant form of worship. It costs the person something. But to those who experience it, it ushers in His presence and draws us closer to the throne room. Praise dancing paves the way for the King. When we exalt His name in worship, be it through song, music or dance, we experience an increased awareness of His Holy presence. When a dancer steps out in faith in dance, there is an increase of His presence because God honors faith and risk. Worship through dance is not limited to those who are experienced, just like singing in church is not restricted to those with vocal ability. God delights in the praises of His people. The bible tells us in Psalm 149:3 to praise His name with dance. Worship dance needs to be reawakened in the church as not just an acceptable form of worship, but an encouraged expression of our heart of worship towards the Lord. Praise dancing, although beautiful to watch, is not about drawing attention or seeking an audience. It is about exalting God through worship and bringing Him glory. To dance to a worship song draws you closer to the heart of God because you express the emotion of the song. It does not draw attention to itself, but simply mirrors and portrays the atmosphere of heaven. Dance is not only a form of worship, but is also an important aspect of intercession. Often during services there are moments in worship when you can feel a shift in the atmosphere. Often this is because someone stepped out in faith creatively; be it on an instrument, vocally, in dance or some other art form. This type of dance partners with heaven and with what God is doing in a service. As you step out creatively in dance, know that you carry the heart of the Father. Worship dance is a powerful expression of worship in the church, and takes people who are hungry to levels in worship they have not gone before. A Christian dance company is a dance company usually specializing in ballet that uses dance as a ministry to reach out to non-Christians or within the church. Ballet Rejoice is a pre-professional Christian dance company in Rocklin, California , USA, . They believe in glorifying God through dance. Ballet Magnificat! is a Christian dance company located in Jackson, Mississippi and considered the premiere Christian dance company in the United States. C Me Dance is a 2009 Christian film , written and directed by Greg Robbins. It was produced by Uplifting Entertainment. Dove Dance School is a Christian based dance studio in Warr Acres, Oklahoma. Dove Dance was founded in 1989, in Pensacola, Florida. Tessa Earl is a ballet dancer who has performed as company dancer for many Christian dance companies including Ballet Rejoice. Scott Blackwell is a Christian dance music artist, born in Fort Worth, Texas. First artist to produce such music for the Christian marketplace. "Extremely peaceful and relaxing. (O4eyes2C) is Ray's best work yet."